Thread: Most sought after WW1 Minis ? This one's for Clipper ! Select your top 4 most sought after WW1 mini models produced by Nexus/Ares - put the detail in your post - you never know. Last edited by flash; 11-08-2018 at 11:38. Fortunately I don't need any of them, but, if pushed, there are a very few types I would like to increase my holdings in. I didn’t vote for it for the expedient reason that I found all three for reasonable prices, the Halberstadt D.III. It’s the only German single gun fighter spanning the gap between the Eindecker and the Albatros line of fighters, and thus had a fair number of single gun Entente fighters it could logically face. But it is definitely one that needs reprinting. The SE5a is on the way back, but it was my favorite dating back to Milton-Bradley’s Dogfight (that great little pamphlet that was included in the game), so I am very happy that it is returning soon. Gotha. Missed the boat on that, and I very, rarely see it for sale. 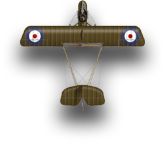 Airco Dh.2. God only knows when this will return. 3 of those 4 were my choices. Picked the balloon instead of Gotha since I have 4 of those. I picked the EIII instead of the DH2 purely because though some exceptional luck I was able to get some DH2s, but have had little of the same luck with EIIIs. My votes for were for the minis I think they should always have available: Camel, Dr.I, Albatros D.V, and Fokker D.VII. Some of the other ones that have not be printed in a while would be nice to have as well, but some of them just need to be on the shelves at all time. I could probably bump the Albatros for the SE5a if I think about it. A Duel pack with the D.VII and SE5a would be really sweet. Dual packs of D.VII / SE.5a and E.III / DH.2 would be a nice change from the two that are currently available, especially since they are re-releasing Series I with the Tripods. The RAF SE5a tops the bill as the most sought after model - as that's due as a reprint next year that'll mean some happy pilots; the venerable Airco DH2 was second; the Pfalz D.III close behind that - another reprint next year and finally the Caquot balloon, yet another promised reprint. I am astounded that there was not even one or two votes for the Bristols. Chris must have been really busy with the Sniper's Times. Late again to find the barn door already closed. Gotha V, balloon, SE5a and Pfalz D.IIIa for me. E.III and DH2 follow closely. You can still find those for under list price - I didnt expect a lot of vote going to “sought after” when you can find them at non-inflated prices. The votes pretty much went to where I thought they would: SE5a, Airco Dh2, Pzalz D.III, Balloon, Gotha V, Fokker E III. I thought the Halberstadt D.III would get more than it did, though. Last edited by Dawn Patrol; 11-20-2018 at 19:10.
i think a halberstad dIII / airco dh2 would be a better match up. Guess I missed the boat. However, had I been on time, I'd have chosen (for airplanes, at least) the SE5a, Pfalz D.III, Airco DH2 and Fokker E.III. The balloon is simply a given ... that's ALWAYS a sought for item and shouldn't even be on the same list as the planes. Well, missed out as usual. Jerry here always takes a nap it seems with his schnapps (guess that's why I always miss the chance of getting onto someone's tail all the time....gulp, gulp.... hickupp..... ). However, there are two airplanes that I would love to see reprinted - SE5a and Fokker DVII especially (man, scum-like people on eBay sell them for 100 bucks or around that at the moment, capitalising on the fact they are OOP). I was already starting to look at 3-D printing them, but having considerable experience with 3-D prototyping, I just know that it doesn't beat cast models (at least not yet) in terms of details and being layered like an onion (hard to get that artefact removed). So there is my humble late input. Do you want to see only new minis, or repaints of existing minis? All times are GMT -7. The time now is 12:28.